Use Radiojar's filtering tools and make your station stand out! 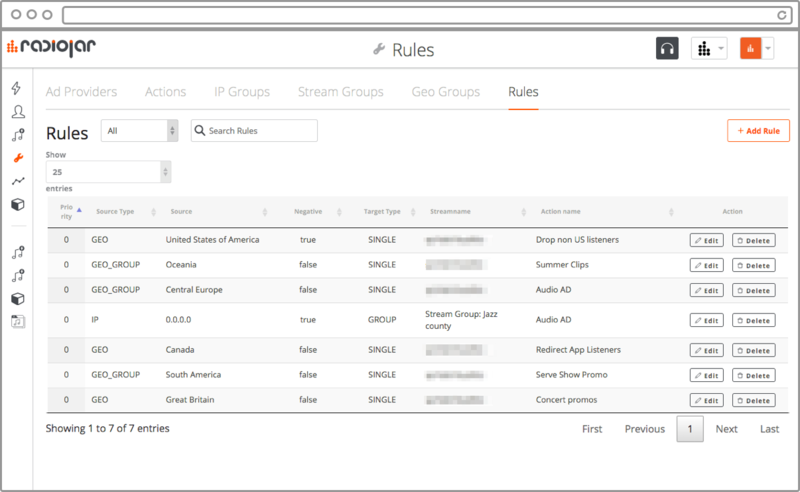 Radiojar's proprietary technology supports a filtering method based on IP-based rules (single IP, IP groups, geolocation) targeting a certain stream or a group of streams. 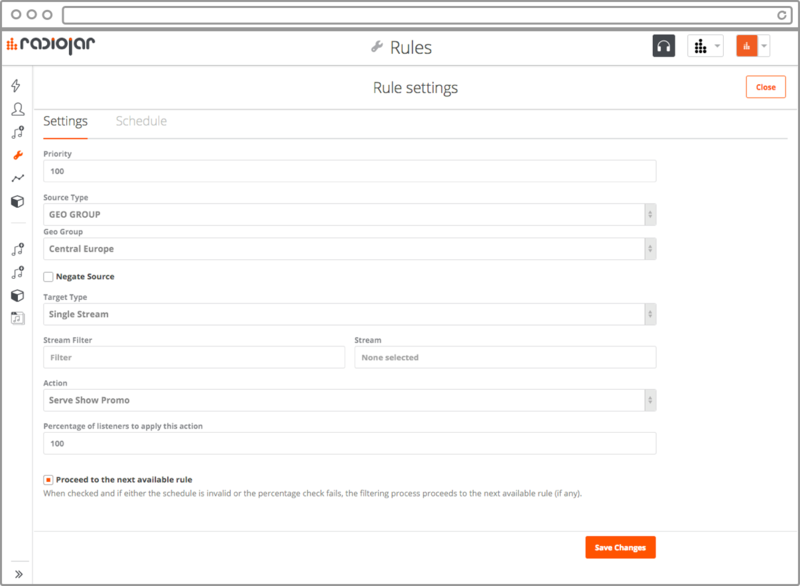 Administrators are granted access to a 'Rules' admin panel, through which they can create stream groups, IP groups and geo groups, and the filtering process is handled. Listener connection is dropped (block access to the stream), optionally injecting a static media file (prompt) before the action. Allow listeners to audition the stream, optionally injecting a static media file (prompt) before the action. Serve pre-rolls and mid-rolls from any VAST compliant ad-provider like Adswizz, Targetspot, Triton Digital, Google DFP. Learn more on our digital audio ads integration. Listeners are redirected to a different stream. Serve your listeners your station's logo or show jingles before they access the stream. Encourage them to tune-in through your own website and mobile apps. Serve listeners your sponsors' promos before they access your stream. Advertise their events, schedule when the event's jingle will air. Run exclusive online contests, announce contest info to your online listeners only. Serve different promos even to listeners originating from the same country. Serve different prompts to different listener groups and check the results. Greet you listeners in their own language!